Are instagram likes worth more than cash? - why you Should think twice before giving your Photographs away to Backpacker Magazine. Giving away your photographs away for likes? Better rethink your business strategy. Presently, I am out in the field for a special research project involving Wolverines, but I wanted to share this clip from this week's Northwestern Outdoors Radio show. Elk photography and my free e-book on wildlife photography. My thoughts on the work that the Wilderness Society is doing to protect and promote our wild public lands, as well as my role in the #OurWild Campaign. It was a pleasure doing the interview and I hope you enjoy it! Photography Inspiration from a "Friend"
Photography Inspiration comes from all kinds of places. Even from people you may not know. Sometime in early April 2016 I received a letter in the mail. I checked the address, it was from a person I did not know. What makes that worth a blog post? This was a handwritten letter from a "friend" I'd never met. 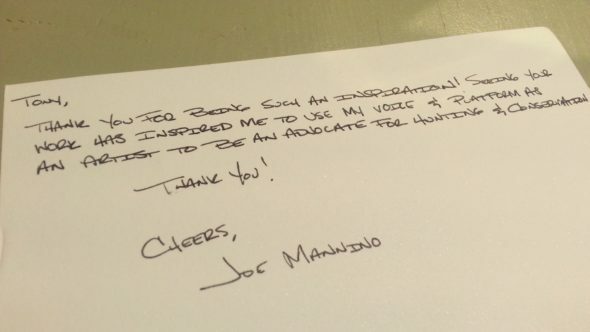 Joe's thank handwritten thank you note. Seeing your work has inspired me to use my voice & platform as an artist, to be an advocate for Hunting and Conservation. 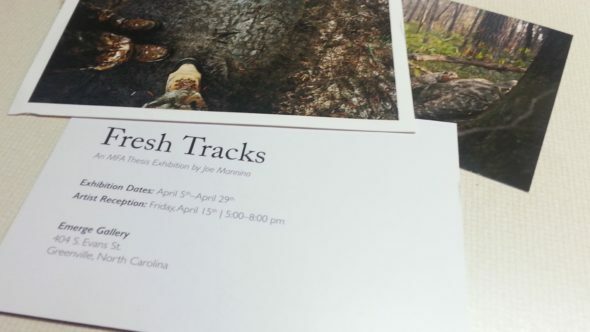 There was also an invitation to attend Joe's, Master of Fine Arts Thesis Exhibition in Greenville, North Carolina. I'm often asked about what I did to "make-it" in the photography world. Most of the time I reference something very simple, like, "I just do what motivates me." Micro four thirds and 4k video - is it time to switch? I've mentioned micro four thirds, aka "mirrorless," in previous posts. As fast and as far as technology has taken imagery, there still are trade-offs no matter the type of photography you choose. 35mm digital single lens reflex cameras (DSLR), along with crop sensor DSLR's are used by most outdoor photographers due to their size, availability, quality construction, quality lenses, and finally, price. I guess one could say, DSLR's today occupy the space on a graph where price and quality meet. Of course there are better cameras with bigger sensors that offer better results, but for most, me included, they are not important to my workflow. 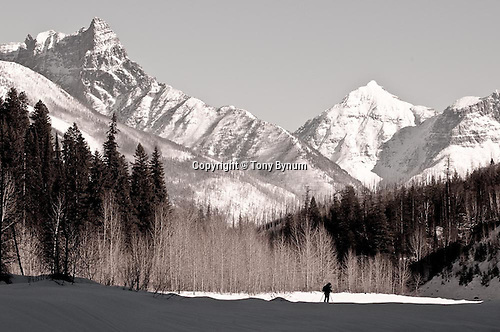 Outdoor sports and adventure photographers, wildlife photographers, and journalists are always looking for smaller, lighter, faster tools, while maintaining a minimal level image and product quality. That minimum level for image quality is today still largely based on the demands of magazine publications i.e., print. So, while I don't like to think I'm compromising on quality, I must in order to get my gear where I need to go - as mentioned, it's a balance between size and quality output. I use full frame Nikon cameras, and large aperture lenses when I'd prefer to use a 50 mega pixel back on a medium format camera resulting in even better files, but that's just not realistic for me, after all I'm a photographer first because I enjoy it! Micro four thirds cameras offer that smaller size equivalent to DSLR's. But the image quality is still not there for print. I have not found a regular place in my professional photographic workflow (although I do own and use a Nikon AW-1 - a small, interchangeable lens camera - but that's for very specific purposes). The Nikon AW-1 while not a micro four thirds camera is a micro, mirrorless, interchangeable camera that fills a similar niche. The Nikon AW-1 is actually an eight to three ratio and not four thirds. I will go into more detail about this camera in a future post, but for now I'll get back to micro four thirds. I've spent dozens of hours using the Panasonic Gh 3 and a good selection of prime as well as zoom lenses. For video, I doubt you can find a better set up, for the price, than the new Gh4. But for stills, mainly because I shoot a lot of low iso in low light, the micro four thirds, like the Gh3 still don't produce the quality of files I need for still photography. I've heard people like Dan Cox say that micro four thirds are good enough for his work and I know there are other's that would agree. Just take a look at Dan's camera bag and read his blog posts about micro four thirds. I love the photo of his camera bag, makes me get scared of photography. In fairness, I like Dan, we are friends, so I'm not ripping on him, I'm pointing out that he's a fantastic, successful photographer and use's four thirds systems. Here's the link to Dan's blog. Simply put, imagine if you need the quality of a full size DSLR with wide aperture lenses and yet you have the occasion to use a smaller, lighter micro four thirds camera. If size and portability are part of the equation, packing two systems does not make any more sense than leaving the DSLR at home altogether. So, I'm not sure how it helps anyone in my business to support four thirds when it's only marginally useful and if you do any amount of travel, it's nearly useless to try to stuff both systems (or more) into your carry-on. . . If you have a different view, or a real solution to this dilemma please share your thoughts by commenting below, we all would love to hear them. On January 10, 2015, I'm not ready to change over to micro four thirds as my primary, commercial photography tool. It's not time for me to switch, but it is time to take notice and work one into to my photography business more completely. If you are interested in learning more about 4k video, and micro four thirds photography, the following video does a great job of showing the benefits of 4k and the weight and ergonomics of micro four thirds. If you're a photographer and have been considering some video work, this video may help you make the move to owning at least one small micro four thirds camera system. 4k might well be the intersection of quality and price when it comes to high quality video. I suggest you take a closer look. The Ansel Adams Act- "to restore the first amendment rights of photographers"
The Ansel Adams Act of 2015. H. R. 5893. To restore the First Amendment Rights of Photographers. of a camera or memory card or film"
As a photographer this interests me a great deal. Years ago I tried to make the argument that the Professional Outdoor Media Association ( the only national traditional outdoor media organization, and I honorably and proudly serve as an executive member of the Board of Directors), should push the first amendment rights of photographers when our "rights" are infringed. Much like the National Rifle Association pushes the constitution rights of Americans to own guns. I was denied support in exchange for my support of a bill that would require photographers and videographers to pay a yearly fee for access to our public lands for filming and photography. That bill never became law, although Murkoski of Alaska introduced the bill and Montana's senator John Tester worked hard crafting it. Today, there's a new bill that shall be referred to as the, "Ansel Adams Act." Its purpose is to return first amendment, constitutionally based rights back to photographers. While the bill does not address video and it will have to define the word "photography" so there's no confusion, it's a step in the right direction. Technology is changing everything and unless our laws keep up with the changing world, we will continue to lose rights, and congress will continue to build it's power over us in exchange for big money from special interests. I would like the bill to go a step further and add some language about video and the number of people that can be grouped together. In the past, regulations have applied to two or more people leaving being outdoors collecting digital media to the pursuits of a single person acting alone. If you would like to read the short bill, you'll find the bill, the "Ansel Adams Act," at this address. I recommend you contact your house and senate members and refer them to the Ansel Adams Act by showing that you support this bill. Share the bill broadly via social media, and if you have the time and capacity, write about it on your own blog. How do you feel about this bill? Does it make sense, would you support it?